"It's too late to talk to Jovenel Moïse and Jean-Henry Céant," The pitit Desalin opposition leader said on radio Magik 9 Tuesday. 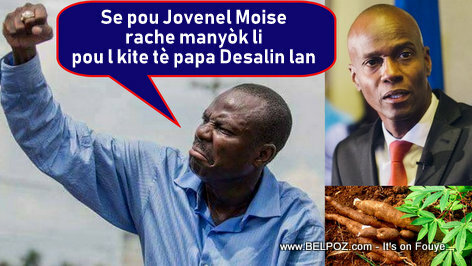 To Moise Jean Charles, the only option is for President Jovenel to step down because he will continue his mobilization in the streets against him. As early at Thursday, November 29, Moise Jean Charles announces streets protest will restart in Northern Haiti. Hmmmm... So much for children going to school! Un con ce bonhomme, un idiot, un super idiot ...Dans tout pays serieux, il devrait etre dans un hopital psychiatrique ..un asile d'aliéné, ou l'hopital moune fou ...First he has to go back to school ..grammar school to learn to write ...to speak...Yo di, analphabete pas bete ...ti tonton zanmi boeuf Milot koré kozé ca ..Analphabet capable Bet...Ayibobo pou Ton Moise..